Amuse Home was established in the Pacific North West in 2017. Its origin was a thorough rationalization of the manufacturing process with an eye to creating simple, low-cost, good quality products. Specifically, we reexamined products through three lenses: material selection, inspection process and packaging simplification. In notable contrast to the prevailing over-embellished products in the marketplace, Amuse Home’s products both won great appreciation and sent shock waves across the world. Amuse Home products are succinct, but they are not in the minimalist style. Simplicity and emptiness yield the ultimate universality, embracing the feelings and thoughts of all people. We have been credited with being “resource-saving”, “low-priced”, “simple”, “anonymous” and “nature-oriented”. Excellent Gift Option – for any festival and anniversary like Halloween, Thanksgiving, Christmas, Wedding, Housewarming, Baby showering, Graduating, etc. Send the most beautiful gift to the one you loved. These attributes can be noticed by our line of products, which are designed with the utmost quality with focus in sustainable sourcing practices. This includes Plastic ware from Belgium, professional porcelain dinnerware from Asia, ceramic ware from Latin America, Soy Candle handcrafted in Canada among others. Set of 6 Eco-Friendly, Sturdy, Stackable and Reusable Dinner Plates made of Organic Bamboo, packed in a beautiful gift box. Size of each plate: 10 inches. With a clean and simple design, our bamboo plates have a smooth surface and a perfect detailed-oriented finish that produces an amazing high-quality product for your home and kitchen. Excellent for any type of meal- breakfast, lunch or dinner. Heavy duty and robust, it is often used in schools, clubs, restaurants, cafes and bistros. Perfect for outdoor usage as well such as parties, picnics, camping and barbecues. Once harvested, bamboo can replenish itself within a year and some species grow a whopping 4 feet per day! Bamboo is 100% natural and biodegradable which gives conscientious consumers real peace of mind. Once you have no further use for a bamboo product you can rest easy, knowing that it will return to the Earth leaving minimal environmental impact. Since bamboo requires no chemicals and very little water to grow, it is an environmental wonder-plant. As if this were not enough, bamboo absorbs more carbon dioxide from the air than either cotton or timber. It also releases more oxygen into the environment which improves air quality. 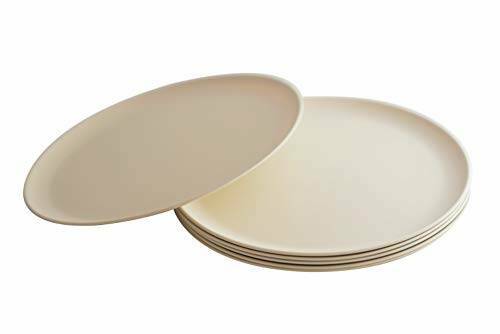 Made in a US FDA Approved Facility, our bamboo plates do not affect food aroma, consistency, or flavor. It can be easily washed and cleaned in a dishwasher, however microwave usage is not recommended. Satisfaction Guarantee: Amuse Home will offer a free replacement or refund if anything goes wrong with the product within 30 days of purchase. They are great bamboo plates These are great bamboo plates. They are very easy to clean and ultra light. We can put them in the dishwasher too, which is a plus! ðð. I also think they will be good to take to outdoor parks, picnics and the added bonus is that we will not be using plastic.The kids love them and we (the adults) do too!